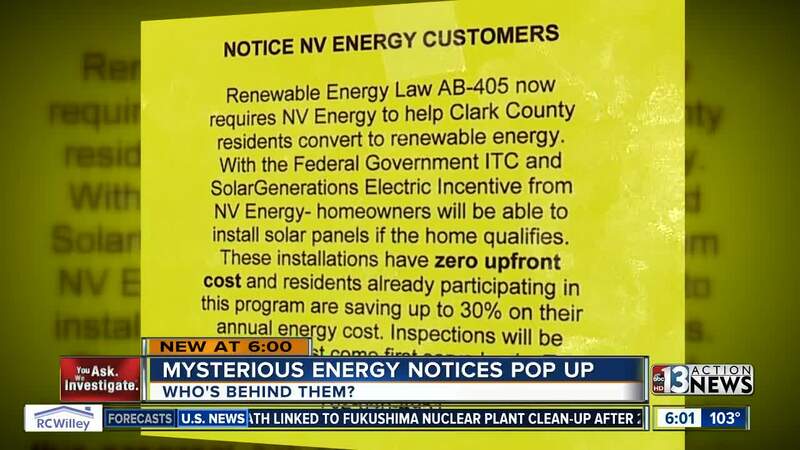 A mysterious renewable energy notice has been posted on some Las Vegas homes which is raising questions about who is behind the promises of much lower power bills. Allan Eaton said he noticed the yellow piece of paper taped to his exterior gate at his home on Wednesday near Spring Mountain Road and Jones Boulevard. "When I saw the language that was used, I was immediately suspicious," said Eaton. The notice cites Nevada law AB 405 and explains NV Energy is required to help Clark County residents convert to renewable energy. It goes on to describe incentives from NV Energy to install solar panels if the home qualifies at a zero upfront cost. At first glance, Allan said it appeared it may have been from NV Energy. "It just didn't seem like something NV Energy would be taping to my gate," added Eaton. Eaton asked Contact 13 to investigate and his gut was right, the notice was not affiliated with NV Energy. "We want the public to know that NV Energy will never go door-to-door soliciting any of our programs or services," said Angelica Silveyra with NV Energy. Contact 13 called the listed phone number and a man named "Joseph" said he worked for Vivint Solar and he partners with NV Energy. Contact 13 reached out to Vivint to verify the notice card and a spokesperson said the cards did not appear to be consistent with the company's policies and an investigation would be launched. An NV Energy spokesperson tells Contact 13 they do not partner with any solar contractor. NV Energy works with any Nevada licensed electrical contractor to provide customers with solar incentives which help offset the cost of installing rooftop solar. A Vivint Solar spokesperson says the notices do not appear to be from any of their employees. The spokesperson said the fliers may have been used by some of their Nevada dealers but they have all been told the fliers are against company policy and should not be used.